The KraussMaffei Berstorff technology day was held in Hannover, Germany on September 19. Around 70 customers and interested parties attended the event. “The event was focused on personal discussions with customers and prospective buyers – a win-win situation for both sides. While customers received expert information on state-of-the art engineering and process technology, we learnt more about their specific requirements and expectations. This will help us in designing even more customized solutions. 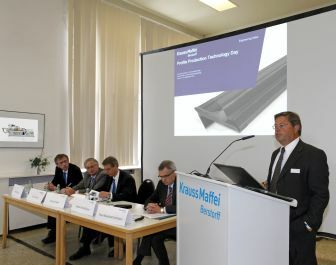 Our profile technology day offered the ideal platform for this synergetic exchange,” declares Paul-Eberhard Kortmann, Chief Operating Officer at KraussMaffei Berstorff. Numerous innovative features of the EPDM profile production line in the technical center were presented. In addition, current market trends in the field of TPE and the KraussMaffei Berstorff machinery range for the production of hybrid sealing profiles were also dealt with. Visitors were particularly interested in the water-cooled extruder drive and the circulating air system for the microwave and hot-air channel that contributes substantially to the system’s energy efficiency. The pneumatic adjustment of the microwave and hot air channel doors for easy access to the treatment chambers arouse great interest. The LabStar line, a laboratory-scale rubber profile production line, was presented at the event. Because of its short set-up times, this line is particularly suited for low output rates. An extrusion line for the production of silicone hoses was also shown to visitors. Thanks to its vertical configuration, this line is designed for contactless hose vulcanization over a short vulcanizing section.